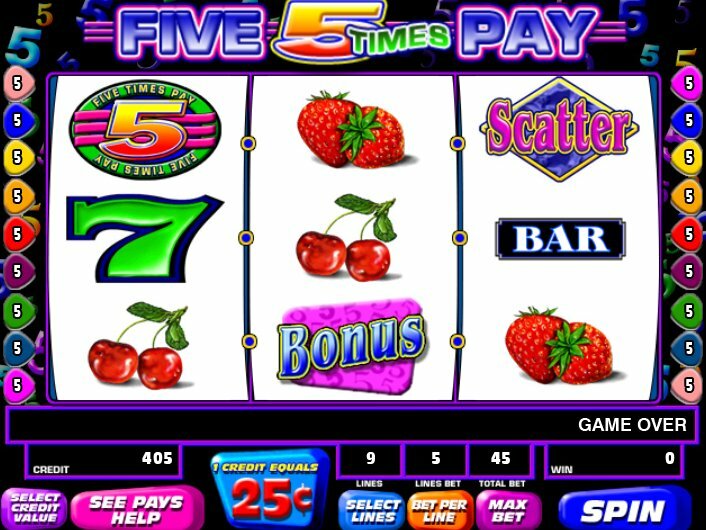 Five Times Pay Slots - Play the Free IGT Slot Machine Here! Five Times Pay Slots is a good slot machine however because all of the combinations pay out higher than what you actually bet. Actually the lowest you can win, if you bet the max of 3, is 6, which is double your bet. The jackpots are really good too – there are three different jackpots, depending on how many credits you use and they range from 2,000, to 5,000, and then all the way up to 15,000. The wild symbol in this game is the number “5” with “5 Times Pay” stamped on it. As the name suggests, the wild symbol multiplies the pay line by 5 when it completes a winning combination – it multiplies the winnings by 25 if two of them complete the combination. It can be found in all three reels, which is a plus, and you will find that it will get you out of a lot of jams. It is not a scatter symbol however. This game is a pretty good one for how simple it is. You find that simple means better n a lot of cases with slot machines. The max bet of 3 is somewhat limiting, but at the very least you know you wont be losing $100 every time you spin it 33 – 40 times.